Built 1900 as "Theatre Republic" by Albert E. Westover for Oscar Hammerstein. 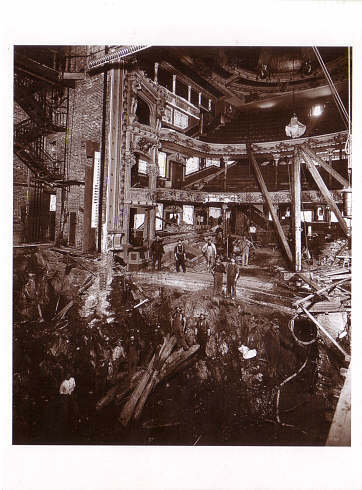 1902 major interior rebuilding by Bigelow, Wallis & Cotten for David Belasco. Re-opened 29 Sep 1902 as "Belasco Theatre". 1910 renamed "Republic". Since 1930 operated as a burlesque theatre by Minsky. 1942 converted to a cinema and renamed "Victory". 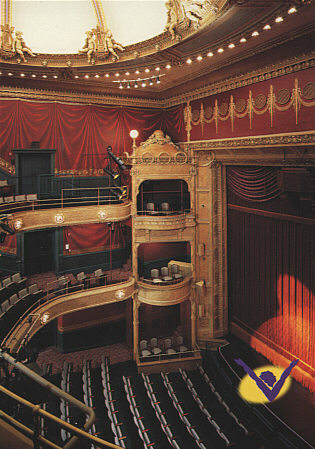 In the 1990s reconverted to a theatre proper to the original 1902 plans, as part of the Times Square Redevelopment Project. Re-opened 1995 as "New Victory Theatre". Reverse Text: "Belasco Theatre (old Republic), New York City, 1902"
Reverse Text: "The New Victory Theater, New York's new theater for kids and families, offers year-round, professional productions - from plays and music, to puppetry and films."